Evolve your leisure centre with our innovative software solutions. Find the best software solution for your fitness and health club. Transform your aquatic facility with these software solutions. Create an innovative swim school program with our software solutions. Explore our range of software solutions for your recreation centre. Jonas Leisure connects you with innovative software solutions that transform your business. Jonas Leisure partner with industry leaders in fitness, leisure and recreation. New South Wales swim centre Aquatics Down Under has received the prestigious 2018 AUSTSWIM NSW Recognised Swim Centre Award in recognition of its passionate teachers, innovative programs and dedication to catering to students with special needs. The Award was presented by Jonas Leisure Sales Manager Bryn Whales at the 2018 AUSTSWIM NSW Awards Dinner at The Epping Club in Sydney on Friday night. Jonas Leisure sponsored the AUSTSWIM Recognised Swim Centre Award, which was one of eight awards presented on Friday night to celebrate AUSTSWIM teachers, presenters and swim centres for their contributions to aquatic education and water safety. In announcing the Recognised Swim Centre Award, MC and former Olympic swimmer Elka Whalan paid homage to Aquatics Down Under’s dedicated staff. 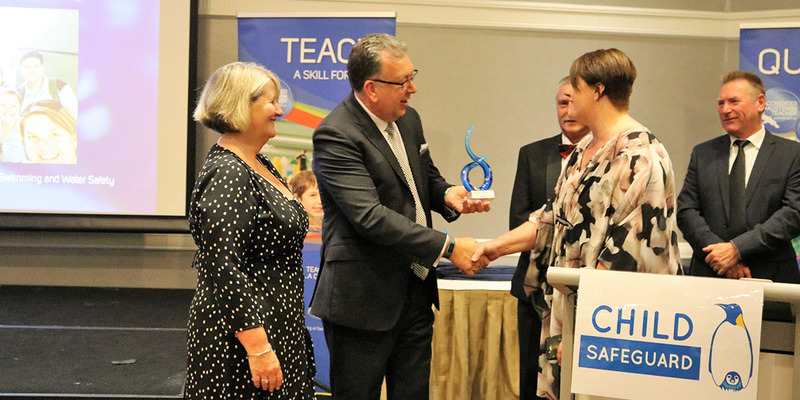 She said the way they engaged with their clients and the range of innovative programs they offered, including for people with special needs, made them an outstanding and worthy recipient. Mr Whales said it was an honour to present the award to Aquatics Down Under Director Melissa Rickwood for their significant contribution to water safety and education. Mr Whales acknowledged all nominees and winners of all awards, and thanked AUSTSWIM for the opportunity to support their teachers and swim schools through sponsorship of the awards. Aquatics Down Under Director Melissa Rickwood thanked Mr Whales and AUSTSWIM and acknowledged the hard work of her staff, without whom the outstanding swim school programme provided by Aquatics Down Under would not have been possible. Ms Rickwood said the swim centre’s location within the North Rocks Shopping Centre made it highly accessible, which added to the success of its programs. Other 2018 AUSTWIM NSW State Awards recipients were Lynette Wooden (Teacher of Swimming and Water Safety Award), Hope Dawson (Teacher of Infant and Preschool Aquatics Award), Alison Feilin (Teacher of Aquatics – Access and Inclusion Award), Petrina Liyanage (Teacher of Aquatics – Access and Inclusion – Adults Award), Lesley Richardson (Aqua WETS Instructor Award), Monique Sneddon (Melissa Van Poppel Presenter of the Year Award) and Diane Gray (Most Outstanding Contribution Award).